← Kiwifruit 1: Why are they so fuzzy? While the literature on the subject is far from exhaustive, there is a fairly pedestrian explanation at least for the mechanism, if not any adaptive function, of unusually green fruit flesh outside of Actinidia: fruits start green, and straightforward mutations in a few key genes cause them to remain so. Like that intrepid, hirsute montane vegan, though, Actinidia performs the task a little differently, and it is a bit of a mystery. To understand why that is, we need some backstory on pigments in fruit and how and why they change as fruit ripens, with a focus on Actinidia. It is reasonable to guess that seed dispersal is the underlying selection force in the evolution of fleshy fruits attractive to vertebrate frugivores (2). The fruit pulp is the animal’s reward for ingesting the seeds within and depositing them unharmed (and with a fertilizer pile) away from the parent plant (see our pomegranate essay for more details on the various structures plants use to entice herbivores that are colloquially referred to as “fruit”). To do so, however, the would-be frugivore must first locate the fruit. The plant only benefits when a frugivore consumes ripe fruit containing viable, mature seeds, so it behooves the plant to ensure that the traits attracting seed dispersers also indicate ripeness. Being frugivores ourselves, we understand that a ripe fruit appeals to all of our senses. The same is true for other vertebrates, who cue in on fruit characteristics that change over the course of ripening: aroma, size, texture, chemical composition (Sugar! Fat! Antioxidants! No, seriously. See Ref. 3), and, of course, color (2–7). The typical color progression during fruit ripening is a shift from green (due to chlorophyll) to variously yellow, orange, or red (from carotenoids), or reddish-purplish, blue or black (from anthocyanins, although you can read our pigments essay about how betalains create this color spectrum in the taxonomic order Caryophyllales instead of anthocyanins). Day-time frugivores demonstrably use visual cues to find fruits, and frugivore species can have distinct color preferences, so it’s not wrong to assume that attracting helpful animals is likely a major function of these pigments. The evolution of fruit color and aroma in different fig species, for example, has clearly been strongly impacted by frugivory by bats or birds, which prefer different suites of fruit characteristics (called fruit syndromes) (2, 7). It is possible, though, that we’ve overestimated the importance of herbivores in shaping fruit color, at least in plant taxa for which birds are not the primary seed disperser (3, 7, 9). I say this for two reasons. 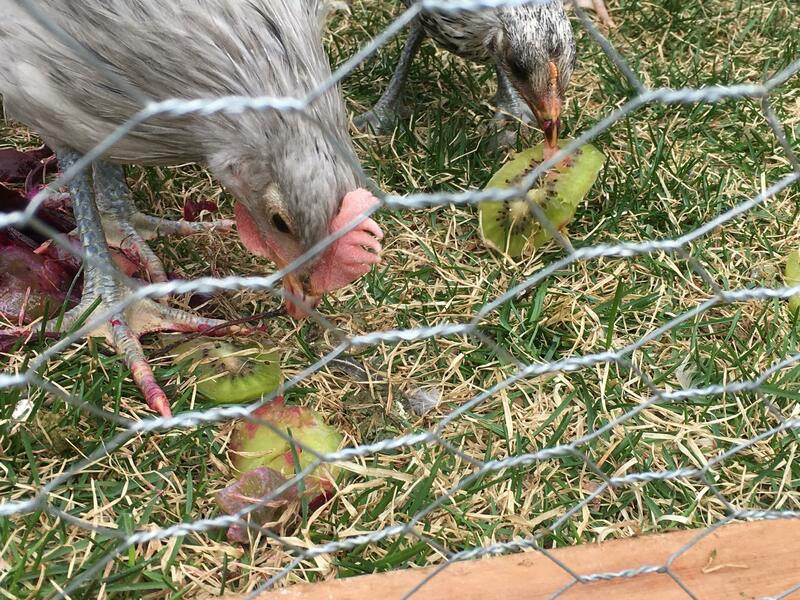 First, for a given fruit-frugivore pair, fruit traits other than color may be more important frugivore cues. This may be the case for Actinidia. A Chinese ferret-badger. The illustration is from the Proceedings of the Zoological Society of London (1862). The Latin name Helictis subaurantiacus has been changed to Melogale moschata. For a modern account of ferret-badgers and Actinidia in China, see Zhou (2008). The Chinese word for kiwifruit is mihoutao, which means “monkey peach,” a reference to the monkeys which are the primary consumer and seed disperser of Actinidia throughout Asia (10), although a huge diversity of other mammals and birds contribute as well (11–14), including the Chinese ferret-badger illustrated above. I particularly like the name monkey peach because peaches are a model system for fruit trichomes that lent insight toward our understanding of kiwifruit fuzziness. Primates (including monkeys) like big, sweet fruit, and a lot of their fruit is colored green, brown, or yellowish-orange (6, 11, 15, 16). Actinidia comfortably fit in this range. Monkey peaches. Fig. 1 from Hallet and Sutherland (2005): mature fruits from (A) A. chinensis var. deliciosa (fruit color green), (B) A. chinensis var. chinensis (golden kiwi, fruit color yellow), and (C) A. arguta (kiwiberry). Bar = 10mm. It seems less likely that primates prefer this drab color palette than they simply don’t care what color their fruit is. Anthropologists used to think that trichromatic vision in primates evolved primarily as a means to distinguish colorful ripe fruit from a background of green leaves. It now seems more likely, however, that primates use their trichromatic vision to distinguish immature leaves, which are often colored yellow or red (17–19), from green mature leaves (6). If primates are visually detecting fruit using color as a cue, as long as the green of the ripe fruit is distinct from leaves, primates should be able to see it. Many primates are also fully capable of locating fruit by its aroma (6). In the fig example I mentioned above, the bird-dispersed fig species produced fruits that were colorful and not particularly aromatic, whereas fruits dispersed by nocturnal bats were whitish-green and highly aromatic (see them pictured below; 7). It would seem that when it comes to primates or nocturnal seed dispersers, plants either don’t bother to expend resources producing pigments specifically to catch a frugivore’s eye, or their ability to do so was lost to no effect, and thus the loss persisted. Second, pigments serve a variety of important physiological functions within plant tissue. If plant survival or reproduction is strongly impacted by the physiological role of pigments aside from their interaction with frugivores, then there’s an argument to be made that physiology, not just seed dispersal, exerts selection pressure on the evolution of fruit color. Fruit color might do more than just indicate ripeness or catch the eye of a would-be animal dispersal vector. Carotenoid pigments—the yellow, orange, and red pigments that include carotenes and lycopene—protect leaves and young fruit from ultraviolet radiation damage and serve as antioxidants (20). So do bluish-purplish-reddish flavonoid anthocyanins (21), which also might protect ripe fruit from fungal infection (3). Additionally, anthocyanins and carotenoids may contribute to a plant’s response to wounding or resistance to drought or freezing (3). Apple and pear growers, for example, know that those fruits need adequate light regimes and possibly cool temperatures in order for red anthocyanin pigments to fully develop in ripe fruit. This is likely because anthocyanins play a photoprotective and temperature response role and are only expressed in high-light conditions (3). Anthocyanins and carotenoids may be present and functional in a green leaf or fruit even if we don’t see them because they are masked by chlorophyll. Chlorophyll is essential to photosynthesis. Its job is to absorb light energy and transfer that energy to the rest of the photosynthetic apparatus within the chloroplasts. Chlorophyll appears green because it preferentially absorbs the blue and red wavelengths of visible light and reflects back the remainder, which is mostly green. The series of chemical reactions involved in relieving the chlorophyll of its absorbed energy, by the way, include those that split water into its component hydrogen and oxygen and release the oxygen into the air (as O2). This evolutionary innovation in chemical engineering precipitated the evolution of all organisms that breathe oxygen. And speaking of evolution and photosynthesis, the carpels that comprise a flower’s ovary evolved from photosynthetic leaves (22–24). The ovary starts green and photosynthetic and remains so through at least the early stages of fruit development in most species. The photosynthesis performed by the immature ovary can substantially offset the large carbon cost to the plant of making fruit and seeds (25–30), by as much as 65% (31). Species that remain green when ripe may maintain photosynthesis (30). This is the case with avocado (32), although I’m surprised that light penetrates the tough peel at all. The photosynthetic apparatus inside of green fruits might be more active with recycling internally respired carbon than fixing new atmospheric carbon, but I don’t know how that interacts with the chlorophyll pigment. With all green-ripe fruits, including kiwifruit and avocado, chlorophyll concentration is highest near the skin, within the range of light transmittance (29, 30, 33, 34). As avocado ripening progresses, chlorophyll breakdown does occur, giving way to the yellowish appearance of both old and new carotenoids, especially near the pit. I suspect that most of us try to consume avocados well before much chlorophyll breakdown has occurred. Photosynthesis typically eventually ceases as fruits mature. The plant enzymatically breaks down the chlorophyll in the fruit, and green gives way to the colors indicative of ripe fruit. Upon chlorophyll degradation, other pigments that may have been present all along but masked by the chlorophyll come to the fore, especially those that provided a photoprotective or antioxidant role for the photosynthetic apparatus within chloroplasts (35). That is the primary mechanism responsible for colorful autumn foliage displays (20, 36). 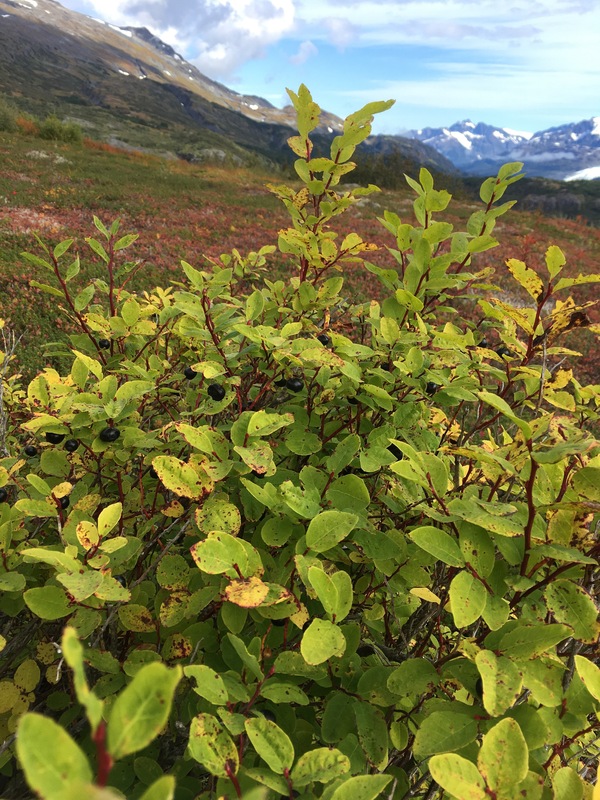 Highbush blueberry (Vaccinium alaskaense), in September in Alaska. The leaves are beginning to yellow, revealing carotenoids underneath the chlorophyll. The berries are full of anthocyanins. 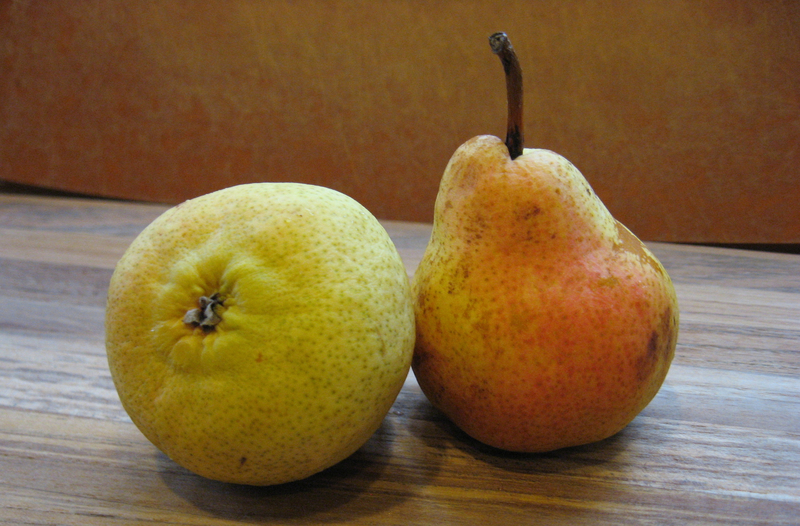 Additionally, new fruit (37, 38) and leaf (20) pigments may be synthesized as these structures mature and age. The chloroplasts in which photosynthesis occurred may differentiate into chromoplasts, in which old and new carotenoid pigments accumulate (39). The mechanisms responsible for green color retention have only been investigated for a few species. We already mentioned that avocado maintains photosynthesis. Other species fail to degrade chlorophyll because of mutations in the genes responsible for that process, whether photosynthesis is maintained or not. You may have seen heirloom tomato and bell pepper varieties that ripen to a chocolate brown color. In both of these nightshades, a mutation stops the function of a chlorophyll degradation enzyme, while the synthesis of carotenoids, including red lycopene, proceeds apace (40, 41). As the preschool-age painter in my house can gleefully attest, mixing red and green makes brown. 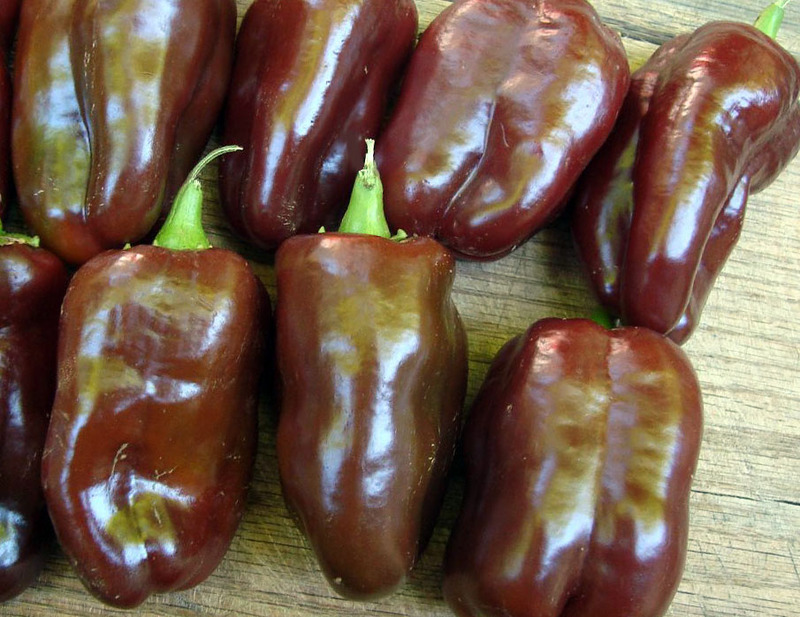 The brown color in these bell peppers is from a combination of green chlorophyll and red lycopene (image from Seed Savers). In a few other green fruits, chlorophyll is partially or fully degraded, but mutations prevent the synthesis of additional pigments. This has been shown for white/green grapes (Vitis) and honeydew melon (Cucumis), which fail synthesize anthocyanins or carotenoids, respectively (42, 43). Neither of these scenarios is the case for kiwifruit. All A. chinensis fruit flesh starts out green. Golden kiwifruit does the usual fruit ripening thing, and chlorophyll degradation occurs. As with brilliant yellow autumn leaves, yellow-to-orange carotenoids are present behind all that chlorophyll and are apparent after the chlorophyll breaks down (44). 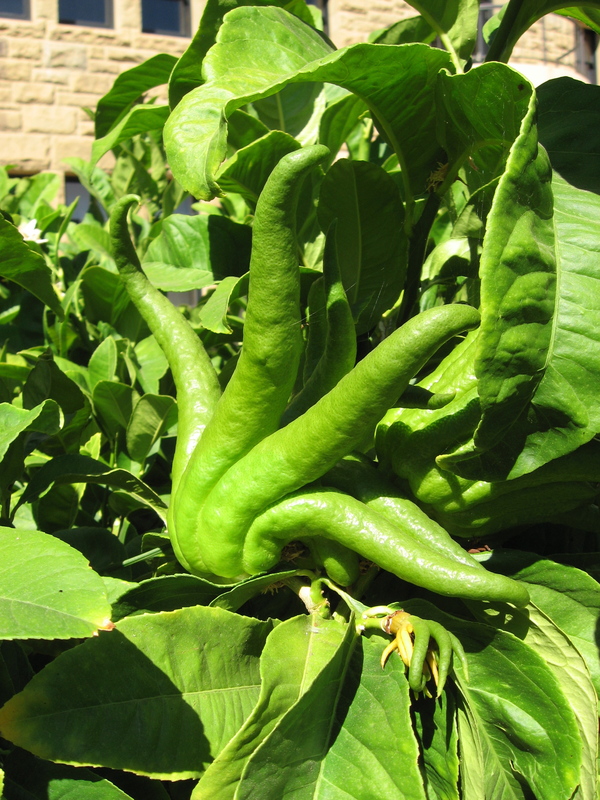 The fuzzy, green A. chinensis only degrades a small amount of its chlorophyll (44, 45), so the bright green color blocks the yellow carotenoids throughout ripening. Having said that, though, golden kiwifruit actually does have slightly higher concentrations of carotenoids than does green kiwifruit (46), so they’ll be more yellow, anyway, and some carotenoids are synthesized only in the later stages of fruit ripening (37). Green A.chinensis kiwifruit actually has functional genes for making all of the enzymes needed for chlorophyll degradation, but their expression is essentially blocked (44). We don’t know for sure exactly how or why green kiwifruit fails to degrade chlorophyll like the golden representatives of the A. chinensis species complex. Scientists suspect, however, that it has something to do with a group of plant hormones called cytokinins (44). Cytokinins are involved in many transitions in plant development and growth (44). Important for our purposes here, they are likely instrumental in orchestrating senescence, which is a euphemistic term for the chemical equivalent of an estate sale. Senescence means the degradation of a particular structure. It starts when large molecules, such as chlorophyll, are broken down, and the plant repurposes the constituent molecules (47) or resorbs whichever of its component parts it can, especially limiting nutrients, like nitrogen and phosphorus (48). Senescence may then escalate to the level of organelle, cell, or organ, such as those autumn leaves losing their chlorophyll and eventually falling from the tree. Cytokinins actually delay or even reverse senescence as it relates to parts of the photosynthetic machinery (44). In short, then, chlorophyll senescence starts when cytokinins stop. Think of it as a kind of fruit menopause. Green-fleshed A. chinensis produces more and different cytokinins than does yellow-fleshed A. chinensis (44). 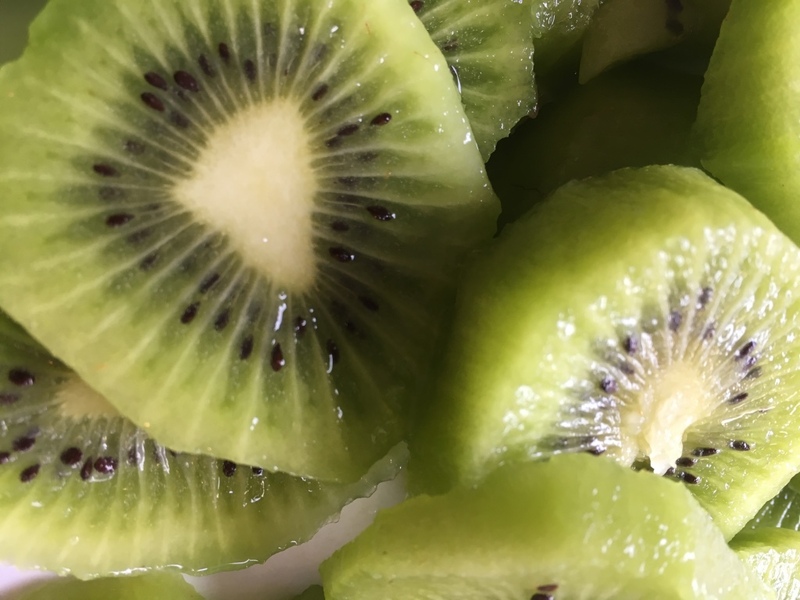 The high levels of cytokinins in green kiwifruit may have been due in part to its relatively low production of a set of compounds that moderate cytokinin (44). Think of this as leaving the cytokinin faucet running in the sink. What we know, then, is that the chlorophyll and chloroplasts in green-fleshed kiwifruit are maintained while awash in cytokinins, like some sort of photosynthetic fountain of youth. As I mentioned previously (and at length in the kiwifruit fuzziness essay), Actinidia is prone to polyploidy. Polyploidy is created by genome duplication events. As the word “duplication” implies, these events introduce a huge volume of new genetic material into a population. Mutations occurring in the duplicated genetic material may provide mechanisms for adaptation to unique environments or, more likely, introduce benign variation into the population (49). We don’t know for sure why the green, fuzzy A. chinensis fails to degrade chlorophyll and maintains copious volumes of cytokinins, but it would be interesting to investigate if this departure from its golden, mild-climate-loving relatives was due to evolution following polyploidy. On the other hand, smooth-skinned green A. arguta tends to share milder climates with golden A. chinensis, and it is also green, and we don’t know at this time if cytokinin dynamics are correlated with a failure to degrade chlorophyll in that species. Green color retention, then, in various kiwifruits may have arisen by genomic accident, and it may have persisted simply because it doesn’t need another color to attract seed dispersers, photosynthetic benefits or not. That same “no harm, no foul” principle behind high chlorophyll expression in ripe green kiwifruit might also apply to other feats at which kiwifruits excel. For example, in our pineapple essay, we noted that kiwifruits, like pineapple, produce copious volumes of proteases, which are enzymes that break down protein. They attempt to do so with the proteins in your mouth or hands, which can feel weird or uncomfortable. We also noted that nobody seems to know why these fruits are so very prepared for protein degradation, and I don’t have an update for you here except for a hypothesis that it just might be another genomic accident that isn’t costly enough to warrant evolutionary extinction. Similarly, if you Google kiwifruits, you’ll quickly ascertain from a bevy of enthusiastic internet nutritionists that kiwifruits are just exceptionally (!) chock full of vitamin C (ascorbic acid). All organisms need ascorbic acid, and it does have multiple physiological roles. In fruit, ascorbic acid is an antioxidant that protects photosynthesis in both leaves and fruit, and it is a precursor for the biosynthesis of other compounds. I asked William Laing, a Fellow at The New Zealand Institute for Plant & Food Research who has long studied ascorbic acid biosynthesis in Actinidia, why he thinks kiwifruits have such high constitutive concentrations of the stuff. He couldn’t give me a good reason, he told me, because science has not studied selective pressures affecting ascorbic acid concentrations in fruits. Well, they have in the sense that we know it would be fatal for a plant to produce none at all, but more or less? We don’t know the answer for vitamin C, much less the pharmacopeia of other organic acids that actually comprise more of kiwifruit biomass than does ascorbic acid. Dr. Laing shared my observation that ascorbic acid concentration varies widely among fruit species, and we know the key genes and enzymes involved, but we don’t know why. 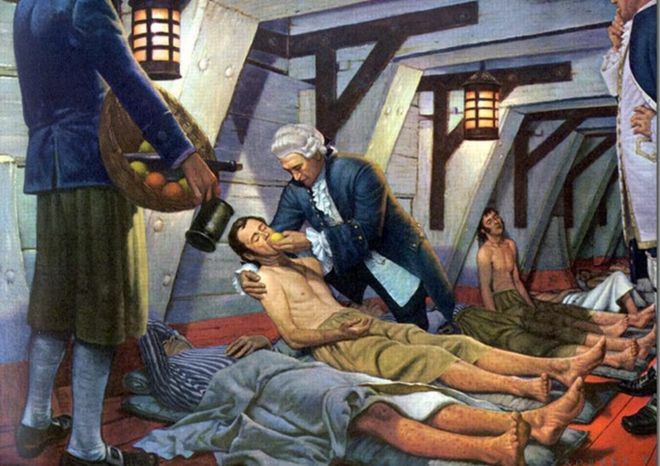 James Lind curing scurvy (vitamin C deficiency) with citrus fruit at sea in 1747. Image via the BBC. We do know that genome duplication events are not a new thing for Actinidia. The researchers who sequenced the genome of A. chinensis determined that the genes responsible for the high levels of ascorbic acid in kiwifruit were among those originating with an ancestral genome duplication (49). At this point in time, then, Actinidia is genetically obligated to produce a lot of vitamin C as a result of a genomic blunder. All that ascorbic acid might be helpful, adaptive in some way that we don’t understand yet. Species occupying sunny or cold habitats, for example, Dr. Laing notes, might especially benefit from high antioxidant capacity, including ascorbic acid. Sunny and cold certainly describes the high altitude and arid habitats occupied by some Actinidia species, especially polyploid varieties (1), so there might be an adaptive story to be told with ascorbic acid in Actinidia. Then again it might be somewhat harmful to produce an unnecessarily large amount of ascorbic acid, a drain on resources. This seems unlikely to Dr. Laing, however, as ascorbic acid never comprises more than 1% of fruit biomass and is made from sugar, which fleshy fruits have in abundance. High ascorbic acid concentrations might also just be a benign artifact of evolutionary history. I personally find this explanation of randomness to be the most satisfying because it mirrors the random genetic mutation in a human ancestor that knocked out our ability to synthesize our own ascorbic acid. The gene encoding the last enzyme in the vitamin C biosynthesis pathway is broken (50). We have to get it from our food. 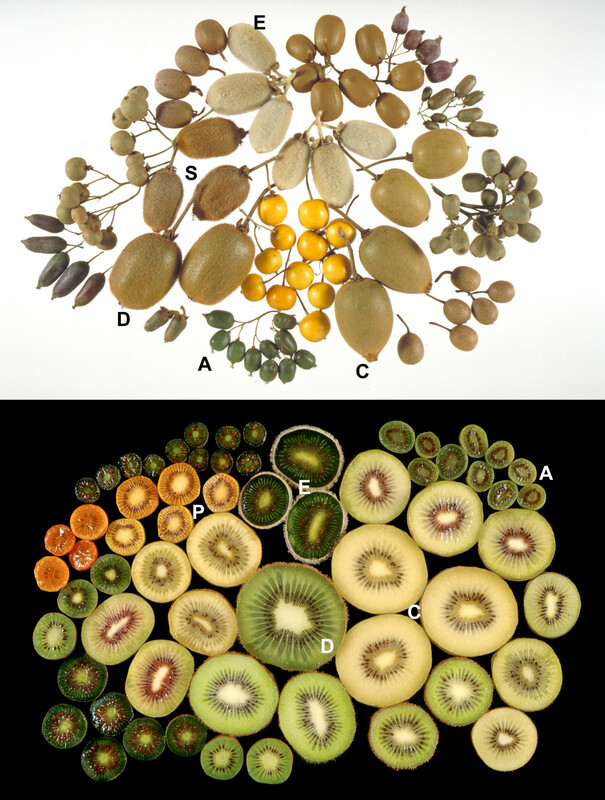 Li D, Liu Y, Zhong C, Huang H (2010) Morphological and cytotype variation of wild kiwifruit (Actinidia chinensis complex) along an altitudinal and longitudinal gradient in central-west China. Bot J Linn Soc 164(1):72–83. Rodríguez A, Alquézar B, Peña L (2013) Fruit aromas in mature fleshy fruits as signals of readiness for predation and seed dispersal. New Phytol 197(1):36–48. Schaefer HM (2011) Why fruits go to the dark side. Acta Oecologica 37(6):604–610. Corlett RT (2011) How to be a frugivore (in a changing world). Acta Oecologica 37(6):674–681. Fleming TH, John Kress W (2011) A brief history of fruits and frugivores. Acta Oecologica 37(6):521–530. Dominy NJ, Lucas PW, Osorio D, Yamashita N (2001) The sensory ecology of primates food perception. Evol Anthropol 10:171–186. Lomascolo SB, Levey DJ, Kimball RT, Bolker BM, Alborn HT (2010) Dispersers shape fruit diversity in Ficus (Moraceae). Proc Natl Acad Sci 107(33):14668–14672. Darwin C (1872) The origin of species (London). 6th Ed. Available at: https://books.google.com/books?id=Ir41BgAAQBAJ&pg=PT1&dq=that+a+ripe+strawberry+or+cherry+is+as+pleasing+to+the+eye+as+to+the+palate+(…)+will+be+admitted+by+every+one.+But+this+beauty+serves+merely+as+a+guide+to+birds+and+beasts,+in+order+that+the. Willson MF, Whelan CJ (1990) The Evolution of Fruit Color in Fleshy-Fruited Plants. Am Nat 136(6):790–809. Huang H, Ferguson AR (2001) Kiwifruit in China. New Zeal J Crop Hortic Sci 29:1–14. Masaki T, et al. (2012) Fleshy fruit characteristics in a temperate deciduous forest of Japan: How unique are they? J Plant Res 125(1):103–114. Koike S, Morimoto H, Goto Y, Kozakai C, Yamazaki K (2008) Frugivory of carnivores and seed dispersal of fleshy fruits in cool-temperate deciduous forests. J For Res 13(4):215–222. Noma N, Yumoto T (1997) Fruiting phenology of animal-dispersed plants in response to winter migration of frugivores in a warm temperate forest on Yakushima Island, Japan. Ecol Res 12(2):119–129. Zhou YB, Zhang L, Kaneko Y, Newman C, Wang XM (2008) Frugivory and seed dispersal by a small carnivore, the Chinese ferret-badger, Melogale moschata, in a fragmented subtropical forest of central China. For Ecol Manage 255(5–6):1595–1603. Jordano P (1995) Angiosperm Fleshy Fruits and Seed Dispersers: A Comparative Analysis of Adaptation and Constraints in Plant-Animal Interactions. Am Nat 145(2):163. 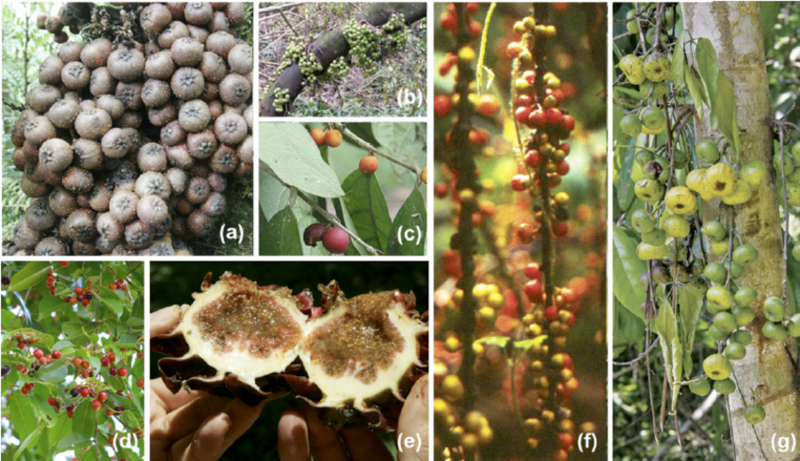 Corlett RT (2017) Frugivory and seed dispersal by vertebrates in tropical and subtropical Asia: An update. Glob Ecol Conserv 11:1–22. Dominy NJ, et al. (2002) Why are young leaves red? Oikos 98(1):163–176. Karageorgou P, Manetas Y (2006) The importance of being red when young: Anthocyanins and the protection of young leaves of Quercus coccifera from insect herbivory and excess light. Tree Physiol 26(5):613–621. Manetas Y (2006) Why some leaves are anthocyanic and why most anthocyanic leaves are red? Flora Morphol Distrib Funct Ecol Plants 201(3):163–177. Lee DW, O’Keefe J, Holbrook NM, Feild TS (2003) Pigment dynamics and autumn leaf senescence in a New England deciduous forest, eastern USA. Ecol Res 18(6):677–694. 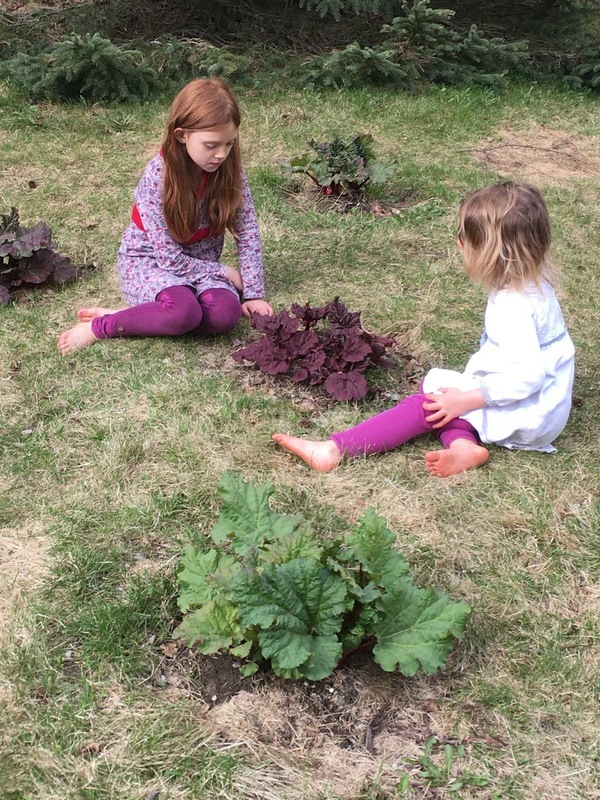 Timmins GS, Holbrook NM, Feild TS (2002) Le rouge et le noir: Are Anthocyanins plant melanins? Adv Bot Res Vol 37 37:17–35. Pfannebecker KC, Lange M, Rupp O, Becker A, Purugganan M (2017) Seed plant-specific gene lineages involved in carpel development. Mol Biol Evol 34(4):925–942. Shepard KA, Purugganan MD (2002) The genetics of plant morphological evolution. Curr Opin Plant Biol 5(1):49–55. Edric Finet C, et al. Evolution of the YABBY gene family in seed plants; Evolution of the YABBY gene family in seed plants. doi:10.1111/ede.12173. Toräng P, et al. (2015) Large-scale adaptive differentiation in the alpine perennial herb Arabis alpina. New Phytol 206(1):459–470. Hoch G (2005) Fruit-bearing branchlets are carbon autonomous in mature broad-leaved temperate forest trees. Plant, Cell Environ 28(5):651–659. Sui X, et al. (2017) The complex character of photosynthesis in cucumber fruit. J Exp Bot 68(7):1625–1637. Galen C, Dawson TE, Stanton ML (1993) Carpels as leaves: meeting the carbon cost of reproduction in an alpine buttercup. Oecologia 95(2):187–193. Aschan G, Pfanz H (2003) Non-foliar photosynthesis – a strategy of additional carbon acquisition. Flora 198(C):81–97. Cipollini ML, Levey DJ (1991) Why Some Fruits Are Green When They Are Ripe : Carbon Balance in Fleshy Fruits. Oecologia 88(3):371–377. Lev-Yadun S (2015) Partly transparent young legume pods: Do they mimic caterpillars for defense and simultaneously enable better photosynthesis? Plant Signal Behav 10(11). doi:10.1080/15592324.2015.1048941. Whiley A, Schaffer B, Lara S (1992) Carbon dioxide exchange of developing avocado (Persea americana Mill.) fruit. Tree Physiol 11(1):85–94. Ashton OBO, et al. (2006) Pigments in avocado tissue and oil. J Agric Food Chem 54(26):10151–10158. Cox KA, McGhie TK, White A, Woolf AB (2004) Skin colour and pigment changes during ripening of “Hass” avocado fruit. Postharvest Biol Technol 31(3):287–294. Gandul-Rojas B, Cepero MRL, Mínguez-Mosquera MI (1999) Chlorophyll and carotenoid patterns in olive fruits, Olea europaea Cv. Arbequina. J Agric Food Chem 47(6):2207–2212. Feild TS, Lee DW, Holbrook NM (2001) Why leaves turn red in autumn. The role of anthocyanins in senescing leaves of red-osier dogwood. Plant Physiol 127(2):566–574. Ampomah-Dwamena C, et al. (2009) The kiwifruit lycopene beta-cyclase plays a significant role in carotenoid accumulation in fruit. J Exp Bot 60(13):3765–3779. Montefiori M, McGhie TK, Hallett IC, Costa G (2009) Changes in pigments and plastid ultrastructure during ripening of green-fleshed and yellow-fleshed kiwifruit. Sci Hortic (Amsterdam) 119(4):377–387. Egea I, et al. (2010) Chromoplast differentiation: Current status and perspectives. Plant Cell Physiol 51(10):1601–1611. Barry CS, Pandey P (2009) A survey of cultivated heirloom tomato varieties identifies four new mutant alleles at the green-flesh locus. Mol Breed 24(3):269–276. Barry CS (2009) The stay-green revolution: Recent progress in deciphering the mechanisms of chlorophyll degradation in higher plants. Plant Sci 176(3):325–333. Allan AC, Hellens RP, Laing WA (2008) MYB transcription factors that colour our fruit. Trends Plant Sci 13(3):99–102. Tzuri G, et al. (2015) A “golden” SNP in CmOr governs the fruit flesh color of melon (Cucumis melo). Plant J 82(2):267–279. Pilkington SM, et al. (2013) Endogenous cytokinin in developing kiwifruit is implicated in maintaining fruit flesh chlorophyll levels. Ann Bot 112(1):57–68. Pilkington SM, Montefiori M, Jameson PE, Allan AC (2012) The control of chlorophyll levels in maturing kiwifruit. Planta 236(5):1615–1628. Nishiyama I, Fukuda T, Oota T (2005) Genotypic differences in chlorophyll, lutein, and β-carotene contents in the fruits of Actinidia species. J Agric Food Chem 53(16):6403–6407. Hörtensteiner S, Kräutler B (2011) Chlorophyll breakdown in higher plants. Biochim Biophys Acta – Bioenerg 1807(8):977–988. Ashman T-L (1994) A dynamic perspective on the physiological costs of reproduction in plants. Am Nat 144(2):299–316. Huang S, et al. (2013) Draft genome of the kiwifruit Actinidia chinensis. Nat Commun 4:ncomms3640. Laing WA, Wright MA, Cooney J, Bulley SM (2007) The missing step of the L-galactose pathway of ascorbate biosynthesis in plants, an L-galactose guanyltransferase, increases leaf ascorbate content. Proc Natl Acad Sci 104(22):9534–9539. This entry was posted in Fruit, Uncategorized and tagged Actinidia, anatomy, chlorophyll, evolution, frugivory, fruit, genome duplication, green, Jeanne L. D. Osnas, kiwi, photosynthesis, pigment, polyploidy, seed dispersal. Bookmark the permalink.